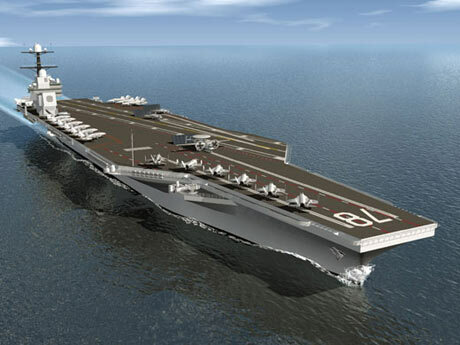 Northrop Grumman Shipbuilding, Newport News, is being awarded a $5,114,500,788 cost-plus-incentive-fee, cost-plus-fixed-fee, cost-plus-award-fee contract for the detail design and construction of the Gerald R. Ford nuclear-powered aircraft carrier. Northrop Grumman Shipbuilding -- Newport News, Newport News, Va., is being awarded a $5,114,500,788 cost-plus-incentive-fee, cost-plus-fixed-fee, cost-plus-award-fee contract for the detail design and construction of the Gerald R. Ford (CVN 78) nuclear-powered aircraft carrier. The contract will include engineering; integration; related development efforts including drawing and work package development; advanced planning; design weight estimate; lifecycle support products and related logistics data; production planning; test and evaluation; further definition of initiatives to reduce CVN 78 class total ownership costs; and other data necessary to support construction of CVN 78. The contract includes one option which, if exercised, would bring the total contract value to $5,144,500,788. Work will be performed in Newport News, Va., and is expected to be completed by Sept. 2015. Contract funds will not expire at the end of the current fiscal year. This contract was not competitively procured. The Naval Sea Systems Command, Washington Navy Yard, Washington, D.C., is the contracting activity (N00024-08-C-2110). This new class of carrier is the replacement for the Nimitz-class design that originated in the 1960s. Advance construction of the Gerald R. Ford began in 2005 under a separate contract valued at $2.7 billion. This advance work allowed shipbuilders to test the design-build strategy, exercise new processes, prototype new features used on this ship before the overall construction contract was awarded, and to build a sufficient backlog of ship units to support production, undocking and delivery. About one third of the ship's 1,200 structural units are currently under construction. The ship's keel will be laid in the fall of 2009 and delivery to the Navy is scheduled for 2015. Enhancements being incorporated into the design include flight deck changes, improved weapons handling systems, and a redesigned island, all resulting in increased aircraft sortie rates. It will also include a new nuclear power plant; increased electrical power generation capacity; allowance for future technologies; and reduced workload for the sailors, translating to a smaller crew size and lower operating costs for the Navy.